Indian market has been waiting for the new Nokia X after revealing it in Geneva’s Mobile World Congress. Recently it is launched in India with a reasonable price of Rs 8,599 which is an Android phone and has a little touch of Lumia. Nokia with its new phone X has entered in the field of Android based smart phones. Hope it can be a good decision for the company. On the other side Moto G is fully android phone with nominal price of Rs 12,599 and here Motorola has tried to give all the features of a perfect smart phone. But according to Indian market, there is a big difference in prices. Still Moto G may prove a better phone. 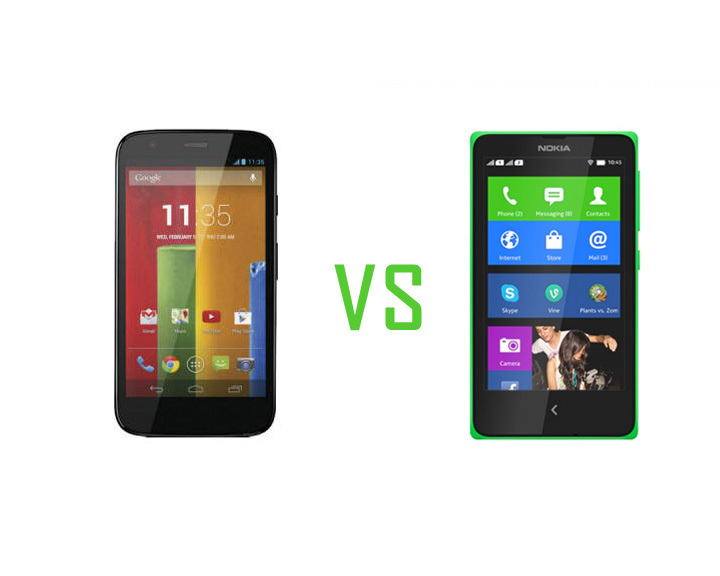 Both the phones are compared here which may help the customer in buying best affordable phone out of the two. Nokia X doesn’t refer to the name of the phones; it’s also the name by which Nokia calls it’s new Android- based OS. The Nokia X series of smart phones was first unveiled at the mobile world. Nokia X Software Platform uses Android open source code as its base, which makes it possible to run the Android apps that a lot of phone-friends crave. Nokia X series phones are not even pure Android phones as it gives a mix of Windows, Asha and Android UI experience. On the other hand, Motorola Moto G is a top of line android smart phones and it is the one which in budget packs and punch. Moto G is a remarkable device, which works well on Android platform. The Nokia android smart phone is too much balanced and its design is also great to attract. Once you use this Nokia Android smart phone, you will sense different feelings with smart phones. The phone packs a completely new user interface which may take time to make its user believe that they are using an Android device and not a Windows phone. SAGMART will give 4 points out of 5. Motorola moto G is a completely Android dominated phone which has Android in each and every bit of it. The phone is upgradable to latest Android KitKat operating system. Besides a powerful quad core processor, the phone packs in 1 GB RAM which is a must for current high definition. It is a good smart phone and holds 4.5 out of 5 SAGMart points. The Nokia X series has got a superb market value. The specification of this device is great. It will cost around Rs.8,000 to Rs.11,000. At this price point, the could become a good choice. Bu it can not be neglected that other companies are offering better equipment list within the same price range, and hence this could make nokia feel a bit low. Here, Nokia’s brand image could perform well in order to emphasis the sales chart. And if you are talking about Motorola G then it is nice device. The overall appearance is outstanding and craze in the gadget geeks for the same has risen to heights. Being a bit high on price, the phone seems to be justified with the pricing. The market cost of this equipment is around Rs.12,000 to Rs.14,000. Moto G is providing better features than Nokia X. Both of the smart phones are Android based but if we talk about value for money for these two products then Moto G is better option than Nokia X. And this is for obvious reasons that Nokia X is equipped lightly and that too without a Google play store. The good thing is it supports third party Android apps which enable users to enjoy all android based apps via a different route. However, Nokia has provided Nokia store in these phones. Here, People who have strong belief in Nokia would definitely go for it, but those, whose doesn’t care about poor service network and want something exciting will prefer Motorola Moto G.
Card slot, 3 megapixels fixed focus camera, and 1 GHz dual core snap dragon 8225 processor. HD Recording, Wi-Fi Enabled, 1.2 GHz Qualcomm Snapdragon 400 Quad Core Processor and 1 GB RAM. Nokia has a strong brand image in India and introduction of Android will make it boost its sales. The phone has got a good external hardware and feels good in hands, but it is difficult to neglect the off features provided in this phone. On the other hand Moto G has got everything which a semi-expensive Smartphone buyer requires and here Motorola Moto G grabs the leading position in the race.